Dollar Graph Growth Arrow Business PowerPoint Templates And PowerPoint Themes 1012-This PowerPoint Template shows the Boosting up Arrow with the Dollar Currency and a man holding dollar in his hand. 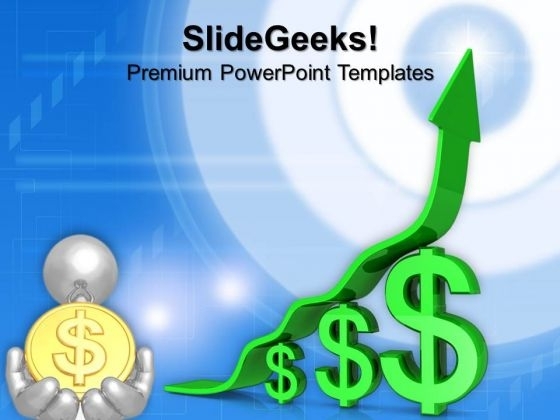 This PowerPoint Template signifies the concept of Finance, Profit, Loss, money, economics, business, investment, backing, sponsorship, funding etc. Colors generate instant reactions in our brains. Use them to your advantage to prioritize your ideas.-Dollar Graph Growth Arrow Business PowerPoint Templates And PowerPoint Themes 1012-This PowerPoint template can be used for presentations relating to-"Dollar graph growth arrow, finance, marketing, success, business, symbol" Identify and solve problems with our Dollar Graph Growth Arrow Business PowerPoint Templates And PowerPoint Themes 1012. Make sure your presentation gets the attention it deserves. Get the value of a lifetime with our Dollar Graph Growth Arrow Business PowerPoint Templates And PowerPoint Themes 1012. Dont waste time struggling with PowerPoint. Let us do it for you.